The mission of the Franklin Historical Society is to seek to preserve and foster appreciation of local history and to maintain living museums for educational and community enrichment. Last Saturday the Franklin Historical Society presented the “Waukesha Regiment” – 28th Wisconsin Volunteer Infantry program by Kent Peterson from the Sons of Union Veterans of the Civil War. It was a most interesting program with Kent reading several letters written by the soldiers. Saturday morning April 20 the Franklin Lions Club held their annual Easter Egg hunt in Lions Legend Park right next to the Franklin Historical Society’s historic village. Hundred of children hunted for the eggs on a beautiful day. Afterwards many parents and children toured our buildings. 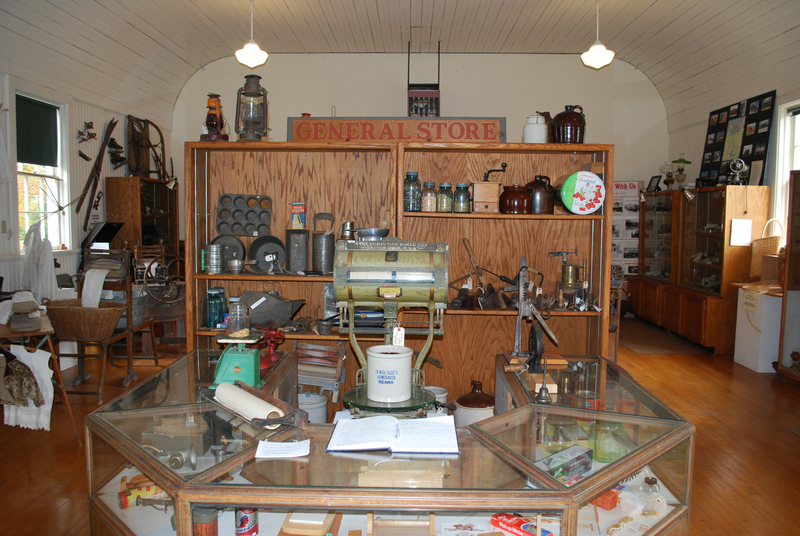 The Franklin Historical Society’s village of buildings has been land marked in 2018 as a “Historic District” by the Milwaukee County Historical Society.Pictured below is our new General Store display in the Old Town Hall. The Franklin Historical Society is pleased to announce another printing of its latest publication, The Stories of St. Martins, by local historian, Robert Storm. The book can be purchased for only $20 at the Franklin Public Library 9151 W. Loomis Rd. or Crossroads ll Pizza & Subs 11357 W. St. Martins Rd., or mailed to your home for a cost of $25 by calling Jim Luckey at 414-421-6539. This book provides a detailed look a the historic village of St. Martins, Wisconsin including who was responsible for the village’s name, its location, and the canal that was planned for the area; when were the former and existing buildings constructed, who did the construction, and names of the family members that resided in them; a look at the businesses and churches, and profiles of some of the founding fathers. The Franklin Historical Society is proud to announce that a City of Franklin permit has been issued, and a contract has been signed with Vesel Contractors to begin construction of the building early in 2019. 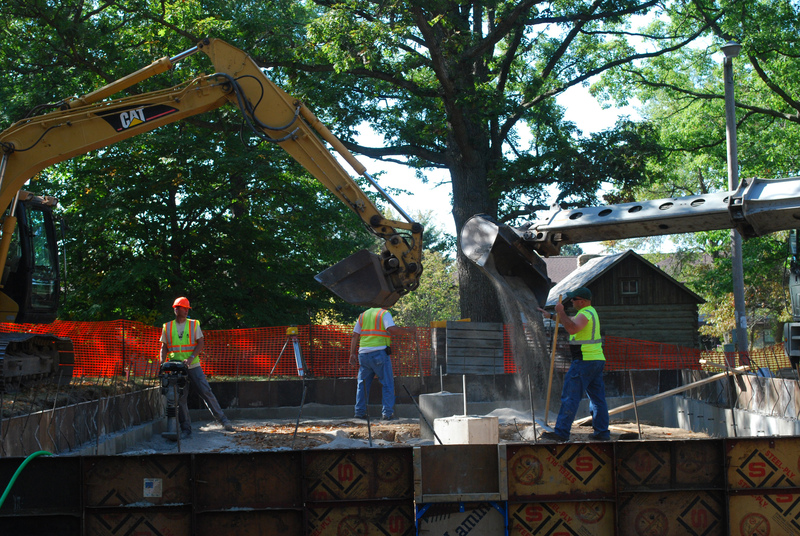 From the picture below you can see the foundation was done in the fall of 2017. We will have a grand opening on the Fourth of July 2019! One of many wedding services in the St. Peters Chapel. St. Peter's Chapel was built in 1869 by families who had left St. Paul's Lutheran Church on S. 51st Street. It remained open until 1883. This photo confirms that the church also served as a school for a time and that the pastor and his wife lived in the upper level. In 1983, the building was moved to the park and is now used for weddings, tours, and annual Christmas services. On Sept. 15 the Franklin Historical Society dedicated our newest building, a smokehouse, which we used for a great cookout. 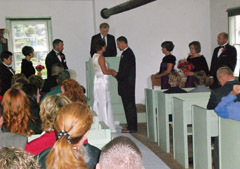 On the 4th of July Mary DeMotto and Neil Verburgt were married in the FHS St. Peters Chapel. Neil and Mary hosted an annual 4th of July picnic for family and friends. Other than their children the wedding remained a secret to everyone until their guests arrived for what they thought was just a picnic. Please follow the link below to our story page for an interesting story written by Judy Scherrer about this wedding. On Saturday December 14 there were three non-denominational Christmas services held in our St. Peters Chapel in Lions Legend Park. After each service, cookies, snacks and beverages were served in the Old Town Hall. Live music and song of the season were enjoyed by all. 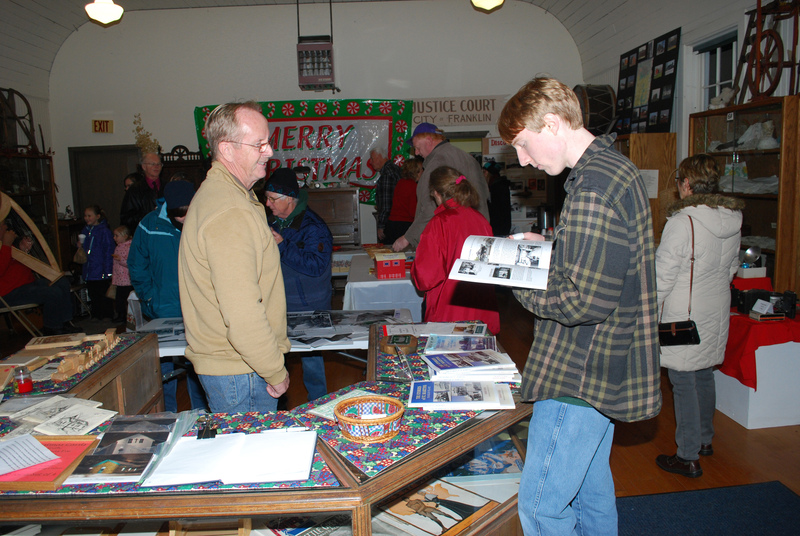 All five of our historic buildings were opened for touring for the wonderful family event. Franklin's Mayor Steve Olson (far left) officially opens the Franklin Historical Society's annual membership meeting. Pictured behind the mayor is The Community Chorus. The chorus gave an outstanding performance for the FHS members and guests! The Franklin Historical Society hosted a Spring Barn Dance at the Hideaway on S. 76st. in Franklin to raise funds for the rebuilding of the historic Wendt family barn in the FHS historic village. Great live music was provided by Vern & The Originals. During the City of Franklin's 4th of July celebration the FHS had this beautiful float in the parade demonstrating our historic barn building project. After the parade we opened our buildings for touring with a record number of visitors. Steve Gyuro pictured here with help from John Borchardt of Calendia completely overhauled the Lions Legend park sign in front of our historic village. The Franklin Lions had donated the sign to the City of Franklin and the FHS many years ago. Steve made one important change by adding a replaceable center that now the picture of one of our buildings can be easily changed so we can feature different buildings. Book signing of "Footprints of Franklin" by author Judy Scherrer"
Our chapel is available for weddings and other ceremonies. Couples interested in a quaint chapel wedding ceremony are welcome to rent the St. Peters Chapel for such a service. The chapel holds up to 50 guests and an organist is available if requested. For reservations, contact Marian Luckey at 414-421-6539 or luckeyjim@yahoo.com. We love to show our buildings to anyone interested in a tour. If your group or organization is interested in a tour please contact us to schedule. Whelan School Living History Experience: Teachers are invited to sign up their elementary class for a day of learning in a rural one room school setting. Contact Barbara Pforr at Bap4@earthlink.net for more details. Tours of our grounds make great outings for Girl Scouts and Boy Scouts.